Royal Caribbean Cruises Ltd. Chairman and CEO Richard Fain said Ebola fears are having a minimal impact on business, despite the flap over the Dallas hospital worker on a Carnival Cruise Lines ship last week. He said the closest parallel is the Severe Acute Respiratory Syndrome (SARS) outbreak 12 years ago, which was much more contagious than Ebola and had a “sudden negative impact” on travel bookings. Fain made the comments during a conference call to discuss the company’s third-quarter earnings. RCCL reported a 34 percent increase in profits for the third quarter. Net income was $490.2 million, or $2.19 per share, compared to $365.7 million, or $1.65 per share, in the same period in 2013. The company expects full-year 2014 adjusted EPS to be approximately $3.45 per share. Fain said the company is progressing toward its Double-Double goal, announced in July, which is designed to increase the company’s return on invested capital (ROIC) to double digits and doubling earnings per share by 2017. 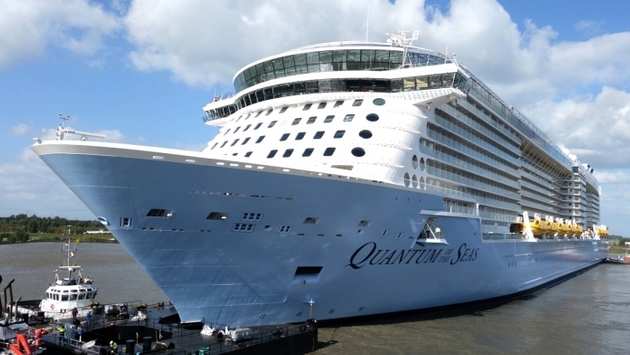 Royal Caribbean International is days away from delivery of the highly anticipated Quantum of the Seas, which boasts many eye-catching innovations. Among the “wow” features are the Sea Plex with bumper cars, the sky-diving simulator, robotic bartender and North Star, the pod-shaped thrill ride that carries people 300 feet above sea level. The new Dynamic Dining program essentially does away with the traditional main dining room and sittings, replacing it with more than 20 restaurants. The technology being introduced on Quantum also is ground-breaking, Fain said, including the super-fast Wi-Fi and check-in that can be completed online so there’s no need to stand in line at the homeport. Also new is luggage-tracking technology so passengers know when their bags are in their stateroom as well as the Royal iQ app that can make restaurant reservations and spa appointments. The company said it is “comfortable” with the Wall Street consensus of $4.55 per share for 2015, which would represent more than a 30 percent increase over this year’s record profitability.